Bruins Players & Alums Will Be “Busy B’s” Over Holidays! ‘Tis the season to “B” jolly and you can best believe the Bruins will be “busy B’s” when it comes to spreading joy to area girls & boys (and families & communities as a whole) this year. In fact, the organization just announced its 2018 holiday charitable initiatives, and as expected there’s no shortage of player and alumni involvement for all the festive fun planned. The entire B’s roster will storm the aisles of local stores on December 7th, purchasing toys and other enjoyable knickknacks for area children in need. Started by B’s Hall of Famer and former Captain Ray Bourque, the annual tradition has been a team favorite for years, where “each member of the team makes a donation which goes towards the purchasing of the toys, and the Boston Bruins Foundation matches the total team donation,” according to the recent release celebrating the season. As you can see from previous social media clips, posts & pictures documenting this event in year’s past, there’s certainly no shortage of smiles & gratitude to go around. 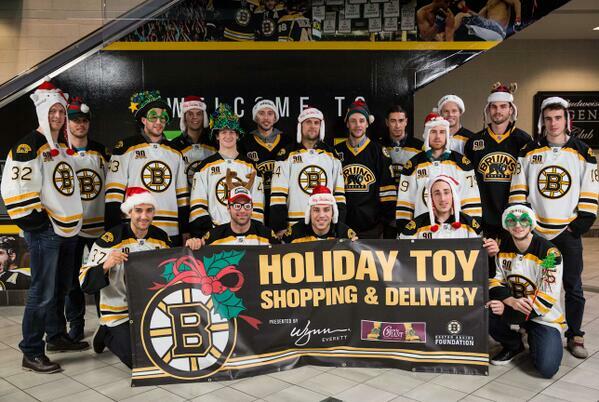 It perfectly “B”-fits the team (just like Torey Krug’s Christmas tree hat below)! Speaking of Christmas trees, O’ what a sight it’ll be for the players’ wives & girlfriends who will be organizing this special event for the second straight year. 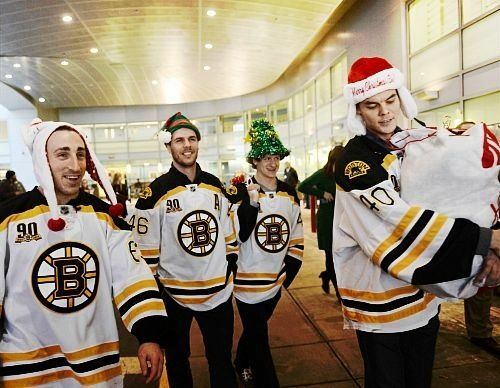 “The Bruins significant others will decorate mini Christmas trees with a variety of items such as autographed memorabilia, gift certificates, and favorite items of Bruins players,” all to benefit the Bruins Foundation as the team’s website mentions. While David Backes certainly had a mini tree with some major goodies on it last year (as you can see from his tweet above), fellow teammates Zdeno Chara & David Krejci hope to continue the tree tradition triumphantly with some solid celebratory “ornaments” of their own this year! “The Festival of Trees fundraiser will take place online at www.bruinsauctions.org and in-game at the Boston Bruins Foundation table located at Loge 4 on the TD Garden concourse during the December 16 and 20 Boston Bruins home games,” with more details regarding player specific trees coming soon, according to the foundation’s website. Widely recognized around the country, and especially in Boston this time of year, is the very successful & meaningful Toys For Tots program, which “will be on hand at TD Garden at the Bruins home games on December 11, 16, and 20 to collect donated toys for children whose parents cannot afford to buy them gifts for the holidays” as prominently noted by the release. Mark your Bruins calendar for these games, as I like to say, because even a small toy donation can make a big difference for a local child and family in need this holiday season (especially if it’s a figurine or ornament of a B’s player)! And while on the subject of B’s players, Bruins legend and newly inducted team Hall of Famer Rick “Nifty” Middleton recently helped kick off the program’s holiday drive in Wilmington, MA, where he also posed for pics and signed autographs for all those making donations to benefit the local kiddos. With additional events planned for not only the Boston Bruins Foundation, but also the Cam Neely Foundation all December, even if you can’t participate in any of the above festivities, you’ll still have plenty of opportunities to score when it comes to giving back in honor of the Black N’ Gold this year.